Der Wikimedia Weltatlas ist eine Sammlung von kommentierten Karten auf Wikimedia Commons. Belgien, Deutschland, Österreich, Schweiz. Rzeczpospolita Polska – państwo położone w Europie Środkowej nad Morzem Bałtyckim. Graniczy z Niemcami (na zachodzie), Czechami, Słowacją (na południu), Ukrainą, Białorusią, Litwą (na wschodzie) i Rosją (obwodem kaliningradzkim, na północy), a poprzez granicę morską (granicę wyłącznej strefy ekonomicznej) również z Danią oraz Szwecją. 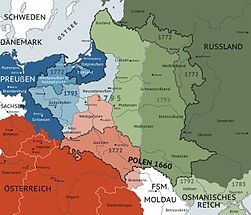 The Republic of Poland is a country in Central Europe or Eastern Europe, depending on the definition, bordered by ► Germany to the west, the ► Czech Republic and ► Slovakia to the south, ► Ukraine and ► Belarus to the east, and the Baltic Sea, ► Russia (in the form of the Kaliningrad Oblast exclave) and ► Lithuania to the north. It also shares a maritime border with Denmark and Sweden. The total area of Poland is 312,683 sq km (120,728 sq mi) making it the 69th largest country in the world with population over 38.5 million people concentrated mainly in large cities, including the most populated urban area of Poland, Silesian conurbation (albeit administratively divided into separate cities and towns), the present capital of Poland, Warsaw, the historical capital, Kraków, and industrial city of Łódź. More images Poland - Poland (Category). Poland has three levels of administrative divisions, shown in this map: voivodeships (województwa), counties (powiaty) and communes (gminy). Map of Slavic peoples in the 8/9c. Galicia (Central Europe), annexed by Austria became in 1867 part of the Austria half of Austria-Hungary (nr. 6). Administrative districts in territories under the control of Nazi Germany in 1941, inclusive Poland. In 1923 the city of Gdańsk became a Free City under protection of the Leage of Nations. Gdańsk was annexed by Germany in 1939 and is now part of Poland. Diese Seite wurde zuletzt am 11. November 2018 um 17:33 Uhr bearbeitet.